Welcome to the Oklahoma Ground Water Association! The Oklahoma Ground Water Association is the only association that provides a united voice, education, networking, and business relationships for Oklahoma's groundwater industry. 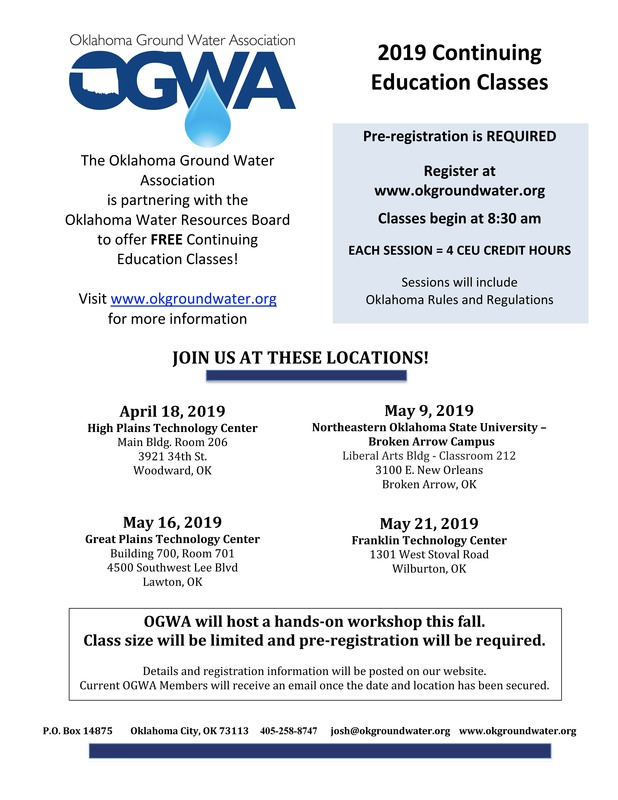 The Oklahoma Ground Water Association is proud to once again partner with the Oklahoma Water Resources Board and our groundwater industry partners to offer FREE continuing education classes. Classes will be held across Oklahoma to help licensed well drillers and pump installers meet their educational requirements for license renewal. More details and registration information can be found below. The 1st Session of the 57th Oklahoma Legislature has convened. Throughout the session we will be tracking the status of legislation with potential impact on Oklahoma's groundwater industry. We will update our Legislative page at least weekly during the session or as additional developments occur. Join or renew your membership today to play an active role in helping us move our industry forward.